MGMT are a musical duo whose 2007 debut album, Oracular Spectacular, made them an instant indie sensation. 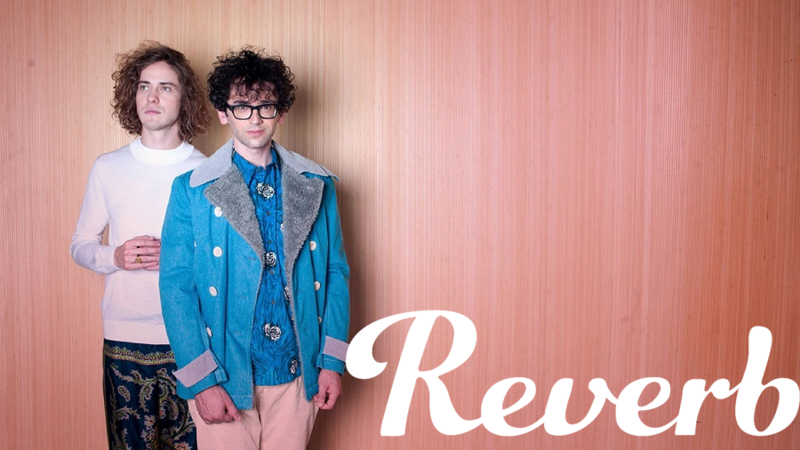 The duo consists of Andrew VanWyngarden and Ben Goldwasser, who met at university whilst both studying music. Both Oracular Spectacular and the duo's recent 2018 release, Little Dark Age, were produced by Dave Fridmann, famous for his work with The Flaming Lips, a significant influence of the duo's. The band gravitates toward naive, fairground-like sounds that have an air of childhood innocence, and they fuse classic-pop arrangements with unusual synthesizer sounds to achieve that blend. Some of their most famous sounds are bright, staccato lead synths, bombastic basses, and fake-orchestral elements. I'll dive into the synths from the debut album's three singles, "Time to Pretend," "Electric Feel," and "Kids," and also touch on how the band, along with Fridmann, approach layering and mixing to create such a huge sound. The song "Electric Feel" features a mellow synth lead over a disco-influenced backing. There is studio footage of the band recording the song, and they can be seen utilizing a Wurlitzer 200A, a Yamaha CS-60, and a Korg Mono/Poly for the main synth lead. For live performances, the band has used the more tour-friendly Moog Little Phatty Stage II to recreate the lead sound, so I'll use the software synth Arturia Mini V, an emulation of the classic Minimoog, to create the lead patch. The synth lead uses mellow-sounding triangle waveforms along with a closed filter and fast envelopes to achieve a rich sound. Open Arturia Mini V and set up a patch with two triangle wave oscillators, one tuned an octave above the other, and slightly detune the second oscillator. Reduce the cutoff frequency all the way and raise the amount of contour (envelope amount) to 2. Set the filter envelope with an attack of 376ms, decay time of around 700ms, and set the sustain to 6, which will create a short fade-in and fade-out effect. Run the sound through a wide delay and reverb effect to add some space to the patch. The Wurlitzer part can be created using Arturia's Wurlitzer V instrument, which can create a range of Wurlitzer tones. The part is buried in the mix, where it works as a layering track. The default patch sounds great, and you can run it through heavy compression and EQ out the high- and low-end to make it sit at the back of the mix. "Kids" was originally released on the band's 2004 debut EP, We (Don't) Care, re-recorded for the Time to Pretend EP, and then again re-recorded with Fridmann for Oracular Spectacular. The song is based on an infectious lead synth line that is later joined by a huge, fuzzy bassline and buzzy chords. The bassline is built in an octave-jumping pattern reminiscent of classic disco basslines, only played on a distorted synthesizer. Using Arturia Mini V again, set up the oscillators with a 16' sawtooth and narrow rectangular (the one on the far right) wave with volumes set to 10, and a 32' square wave with the volume set to 2 providing some sub bass. Make sure the soft clipping switch on the extreme right side of the interface is on, which will create a subtle overload effect. Lower the cutoff frequency knob to the 1 mark and run the patch through some saturation or mild overdrive to add some bite. The chords in "Kids" are played with a metallic sounding synth patch that utilises square waves and pulse width modulation for a bright, buzzy sound. For this, I've used Arturia Prophet V, a great sounding emulation of the legendary Prophet synthesizers. The synths are polyphonic and well known for their sound, and MGMT have used a Dave Smith Instruments Prophet 12 for live performances. In Arturia Prophet V, set both oscillators to square waves, make sure oscillator B's fine-tuning is set to 0%, and set the PW knob to 0.05. Lower the cutoff knob to the 3 o'clock mark and raise resonance to the 10 o'clock mark; this will filter out some of the buzz from the high end. The synthesizer lead in "Kids" is the song's primary hook, and the straightforward melody is played on a synth patch reminiscent of a children's fairground organ. To program the patch in Arturia Mini V, use two oscillators, both tuned to 8', with one set to a narrow rectangular wave and the other set to a triangle wave. Then, bring the volume of the rectangular wave down to 3 to achieve a smooth blend of the two oscillator sounds. To thin out the sound whilst keeping it bright, lower the cutoff frequency to the 1 mark (1950Hz) and raise emphasis to 6. Leave the envelopes wide open with full sustain. EQ and saturation play a big part in the final sound, so add a low-cut set to around 800Hz to filter out some of the low-end, and add some saturation. Triangle waves can generally be pushed a little harder before they start to break up, so don't be afraid to push the saturation hard for a nice, bright sound. I used Soundtoys Decapitator with drive set to 6 and the tone knob set halfway to bright. The band talks about the writing and recording of "Time to Pretend" in this SongExploder episode. In the episode, they discuss how they used software synths from Reason, as well as being inspired by "really good, fake sampled orchestra instruments." The lead patch is reminiscent of the "Kids" lead and can also be programmed in Arturia Mini V. Set Oscillator 1 to a sawtooth wave, Oscillator 2 to a square wave, both tuned to 8', and Oscillator 3 to a sawtooth wave pitched an octave up. Now we'll add the vibrato to the patch. You'll need to open up the extension panel to get to the modulation section, so click on top of the interface to open it up. In the modulation section, set LFO as a source going to VCO123 FM, the pitch of all 3 oscillators, and set the amount to 0.0139. Now go to the LFO section and raise the speed of the LFO to 10.74Hz to get a fast but shallow vibrato. To create the huge bass that comes in for the verse, we'll use Arturia Mini V's built-in chorus effect, also located in the extension panel, as well as a distortion unit. For the basic synth patch, use narrow rectangular wave set to 32', 16', and 8', with the volume and all the oscillators cranked to 10. Filter out some of the high end, but set the cutoff frequency to 2 and filter emphasis to 2. In the effects section, turn on Chorus and set the mix to 40% wet and depth to 0.35. Process it with a heavy distortion unit to break up the sound and an amp simulator to add some grit. I used Soundtoys Devil-Loc Deluxe set to the BassEdgyMix setting, and Ableton's own Amp effect on the bass setting, with the mix set to 15%. A big part of MGMT's sound comes from producer Dave Fridmann's mixing technique, which uses aggressive EQing and generous amounts of distortion. This was a sound he perfected while working with The Flaming Lips on albums such as The Soft Bulletin and Yoshimi Battles the Pink Robots, and these records were likely a big reason that MGMT decided to work with Fridmann. To emulate the sound, use high- and low-cuts to place every track in its own area of the frequency spectrum. Many of the leads have very narrow bands where they sit in the mix, with everything above and below filtered out. Although this makes the solo tracks sound thin, it makes them sit in the overall mix very well. Following the aggressive EQing, things are run through light distortion or re-recorded through speakers to give them added grit. This allows software instruments to sound more "real," and also gives the mixes a bright, driven sound. Lastly, everything is processed with really heavy compression that favours fatness over dynamics. Don't be afraid to experiment, and always rely on your ears to determine what works best. About the Author: Dan Carr runs Reverb Machine, a website dedicated to exploring "the wonders of synthesizers and music production." Check out his site for more breakdowns of popular artists' use of synths and unique recording techniques. Below, you can download the Arturia and Soundtoys patches used to recreate MGMT's tones—and the Ableton Live sessions for each track.